Name- Class 58 (58004 reviewed). 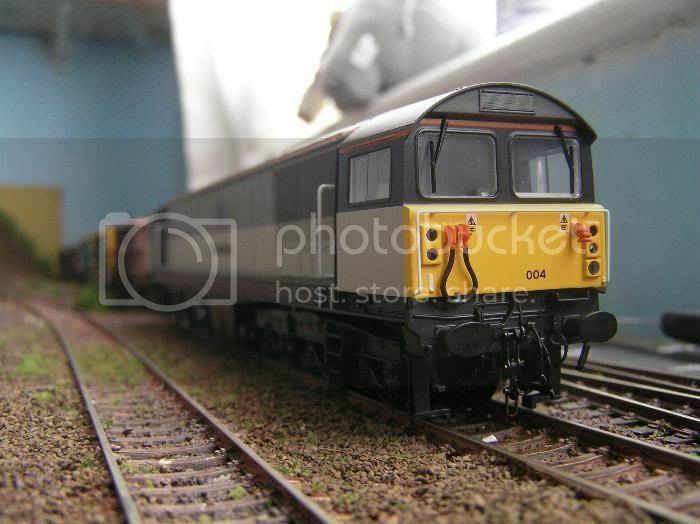 Available- Mainline blue, Railfreight red/grey, Railfreight triple grey coal sector, Triple grey with mainline branding (as reviewed), EWS livery. Version one and two models available with detail differences. Having finally got round to buying a successor to my much loved Hornby model here's a review of the Heljan Class 58. First of all this model has received much criticism from various parties and I wish to make clear that much of this is (in my opinion) unjustified nit picking. The model looks like the bulky, modular "58" it represents. All the detail on the body sides is there with the multitude of doors and fittings all rendered very well. Much criticism has been made of the lack of mesh grilles but the moulded ones fitted actually lend themselves incredibly well to the prototype. The grilles are very fine and the X shaped struts behind are cleverly rendered as if in relief to create more depth. My only issue here is the painting of all these grilles in the same colour as the body side when they were dark grey, almost black on the prototype. This issue is repeated on the doors which are a continued theme of the Rf grey livery when they too should have been black. The roof depicts the odd looking "58" silencer very well and the two fan grilles are see through mesh with the fans beneath. Heljan has been slammed for not providing working fans but they're far from essential and those provided look the part. Cab fronts are the best area of the model and have well made multiple working cables separately fitted and incredibly good wire handrails miles ahead of Hornby's moulds. the body side handrails are also good. Buffer beam detail if nice but can be a tad tricky to remove. The scale coupling is nice and loose and swings realistically as the loco clatters through point work. Minor things that are noteworthy are the numbers, for some reason printed with the 58 in the number as bold type. Not really noticeable but still odd. Also noticeable are the open cab windows, one at either end on the sides. What were Heljan thinking here? Had they simply left all windows shut the model would have looked fine, opening them exposes the thickness of the glazing which looks ludicrous if you look close enough. In the same area the cab interior is very crude compared with what is available elsewhere. Thankfully this isn't too noticable but if you're planning on adding a crewman to the cab he'll have to be sliced in half at the waist. Below the body the chassis is well detailed enough for me at least, although some seem to have disliked the bogies which could possibly have had more relief. Performance wise the â€œ58â€ is a powerhouse of a loco. Heljanâ€™s AIA-AIA configuration (the outer axles of both bogies powered) is plenty and very strong. On the downside it seems to stall more readily than my other high spec diesels, but thatâ€™s probably down to my track cleaning! A word should be made on couplings, an area in which Heljan are ahead of the competition. Compared with Hornbyâ€™s body mounted NEM pockets on springs (which derail wagons at every possible opportunity) Heljanâ€™s version, mounted on a flexible plastic arm is very reliable and usable. The biggest downside to this great model is in my opinion the lighting. In forward motion itâ€™s good, although not up to the standards of modern Hornby offerings. However the rear tail lights bleed into the headlight on one side making it look like there are two tail lights and one much dimmer third light. The white headlights also illuminate on both ends at some higher speeds, though Iâ€™m told this is a fixable issue. The model is DCC ready although the decoder socket is not marked with pin one, I had to guess orientation and look to see if the lights were on in order to get it right. The above is best done with the body off, as removing it even once is migraine inducing! There are four clips holding the heavy chassis block in place but even if you do, for a brief time have them all unlocked the thing still needed a screwdriver to prise it off. 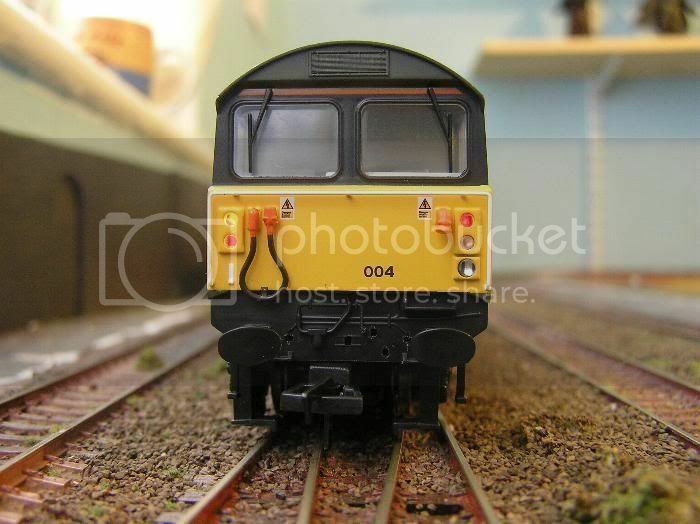 This model is much improved over the Hornby offering and many of the issues people have had with it (lack of mesh grilles on body sides and incorrect number printing) are trivial. It looks like a â€œ58â€ and performs like one, and by this fact it is a good model. Plus- looks, detail, performance, couplings, improves on Hornby model. Minus- erratic lighting, open windows, poor cab interior, body shell difficult to remove. Last edited by Metrocamel on Fri Aug 22, 2008 12:54 pm, edited 1 time in total. A very good and detailed review of the Heljan Class 58. Thanks for that. 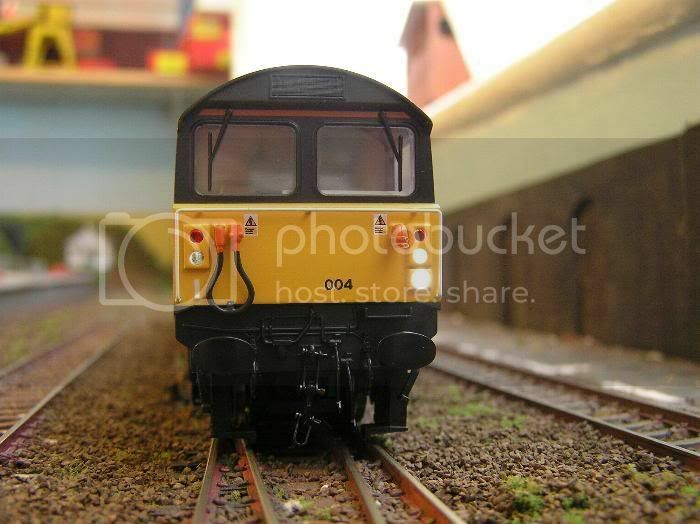 I am not a diesel fan but she does look good on your layout. You may be able to fix the light bleed with some white paint followed by black on the LED. Would it be possible to get a couple of photo's of the NEM pocket you spoke about. I am interested in how their mechanism works. Excellent review and thanks for the inside. Thanks. the couplings are similar to those on the Bachmann MEA hopper which I also have, although the "58" ones are much more flexible and pivot further. 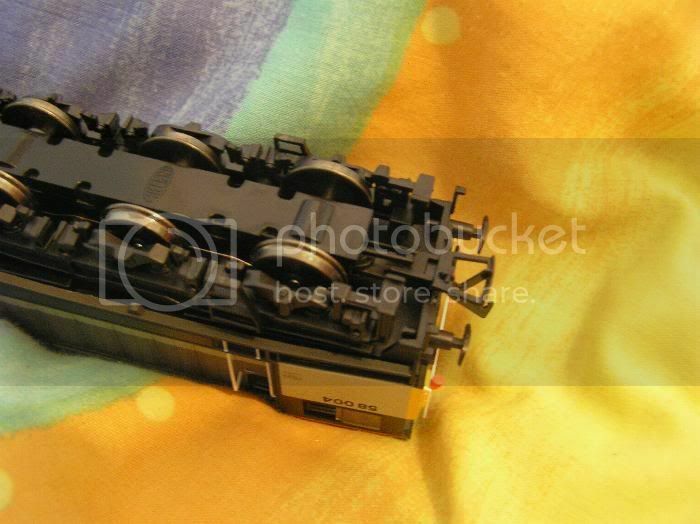 As you can see the pocket is on a flexible arm, no fancy springs like on Hornby's version and is very well made. This is the Kalashnikov of couplings, nothing to go wrong! As for the lighting, the bleed of the red tail lights into the headlight on one side could be solved by blocking in that headlight altogether, as only one side is meant to illuminate and there is no day/night running switch. When the headlights sometimes come on at the tailing end I read on some site that this can be resolved by modifying the circuit board in some way, possibly something to do with one of the capacitors in DCC operation. Front, the lights are nice and bright but with a slight bleed into the tail light on the opposite side. Rear, both tail lights illuminated but also the left hand headlight. The otehr headlights can show up white sometimes at high speeds. Q is there room for a speaker inside? 2 trains, 2 railroad tracks, one going the other one coming back. Click Clack, Click Clack. Difficult to say as I've never actually seen a sound decoder up close. Model rail said it would be a tight fit but on Youtube there's a Heljan 58 with sound so I think it should be ok.
Found this on you tube! Altered review to include cab interior. Must have forgotten to mention it.